I have been to Pride events before, and they have always had the power to make me feel me feel really emotional. In an idea world there would be no need for them, as in a way it’s self-imposed segregation. It’s like we’re creating an event that points our our differences from the straight world whilst in the pursuit of equal rights. But as things stand right now, I still find them very necessary. Things have moved on such a long way over the last ten years or so. In the last year alone I have watched two of my best mates get married, and another two become parents through adoption. Pride events really celebrate those changes to society. There’s still some way to go, but LGBT rights seem to be at an all time high. My partner and I were recently on holiday in Florida. We weren’t aware when we booked the trip, but noticed that Orlando Pride was on whilst we were there. We’d recently been to Pride in Manchester here in the UK, so thought we’d go along and see how the Americans do it: bigger and better, of course. 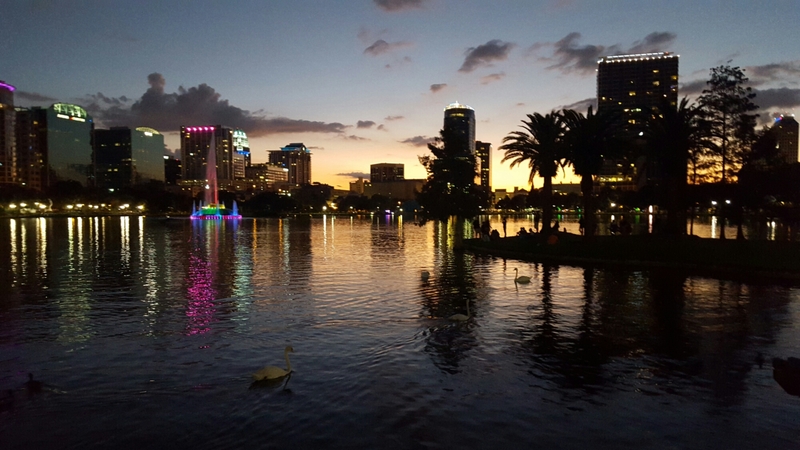 We got a taxi to downtown Orlando, and followed the crowd to the park where the event was being staged. Everyone was in good spirits, and the atmosphere there was amazing. We had something to eat and drink, and watched some of the live music before heading out into the streets to get a good spot to watch the parade. But with the park behind us, suddenly the mood changed. 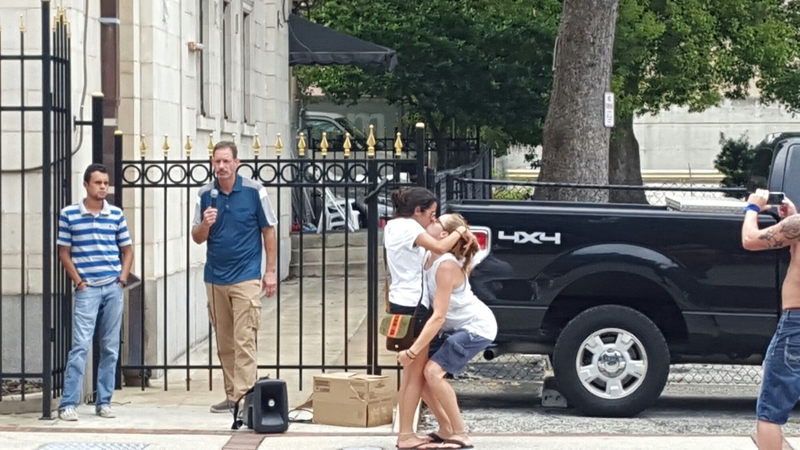 Two men were stood on the sidewalk opposite with a microphone and a speaker, preaching how homosexuality was a sin and we should all repent or go to hell. Now I’ve got to hand it to these guys, they are much braver men than I am to speak out about the immorality of being gay at a gay pride event. I’m sure I don’t need to tell you the kind of opposition he came up against. 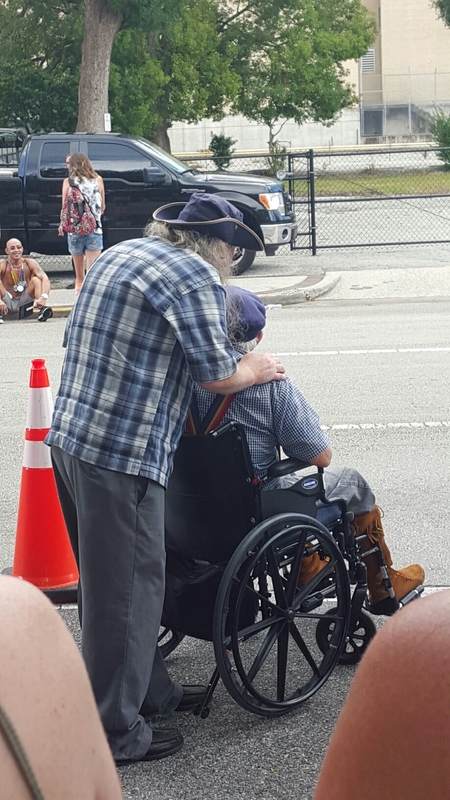 In front of me was an old man in a wheelchair, being pushed around by his partner. He was getting more and more upset by the minute by what this man was saying. It must have been hard for him to hear. His generation have gone through so much struggle, just to be with the person they loved. 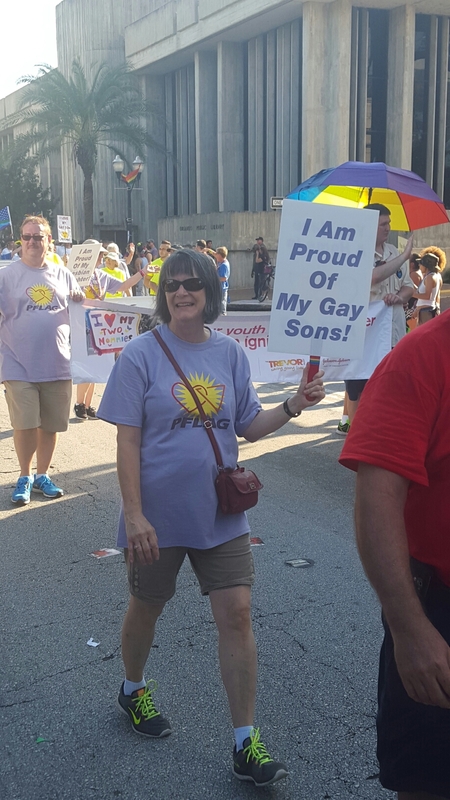 It was because of them that so many teenagers there were able to be out and proud of who they are. The presence of such people sets things back years. To the side of us was a woman in her early forties. She started telling us how she grew up in a teligious background, and had to live a lie her whole life because of her families views. She had finally told her parents and was now living as who she was, with a woman she loved. She and her parents no longer spike, but she was happy with her choice. 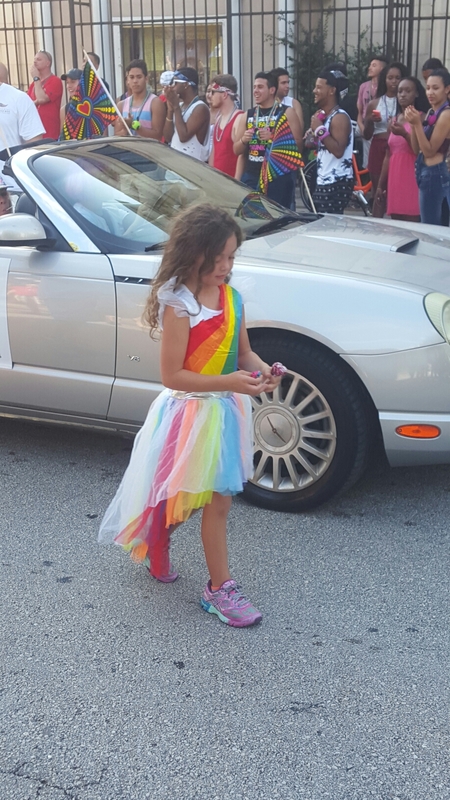 This was her first ever pride, so it meant so much to her. She was gwtting upset because she didn’t feel like she should have to choose between her god and her sexuality. At first I was angry with what I saw, but then I thought about the way things have changed, even in my life time, and how their archaic views will die out with their generation. Many people tried to unplug the mic, or make off with the speaker to silence them, but little could be done. The police had arrived on the scene, and instead of moving them on for causing a public disturbance, they stood either side of them like bodyguards, protecting their right to free speech. It was clear that if anyone was to go for them, then they would be the ones getting arrested. But it was these two girls who managed to silence them, if only for a few moments. Of course the silence didn’t last for long, and the man on the mic continued his hate campaign. They lost out in the end though. As soon as the parade started, they were drowned out by the sounds of festival music, airhorns and cheering. This girl showed how the future generation think which made me smile. What was so great about the event, was how inclusive it was. There were straight people supporting their gay friends, parents supporting their gay children, and children supporting their gay parents. It wasn’t just a day for the gays, but a day for everyone who was in support and wanted to celebrate diversity. When I was at school, being openly gay was just not possible. My life would have been made hell. So I was pleased to see so many openly gay teens, maybe as young as thirteen or fourteen. I was showed how much things had moved on, even in my life time. 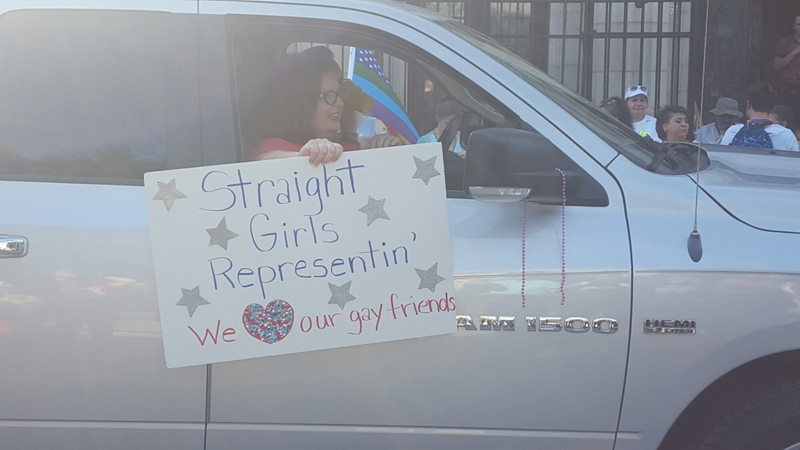 It was the first Pride in Orlando since the equal marriage rights bill had been passed, so there was a real feel of achievement and togetherness in the air. After the music there was a series of speakers, from politians, activists, and the mayor Buddy Dyer. This is when things started to feel different to UK events, where the party doesn’t stop. But as an outsider it was great to hear what they had to say and be made to feel part of such a special day. After that we took a walk around the park and witnessed the most spectacular sunset I have ever seen. These images will forever be with me. So thank you all at Orlando Pride for making this such a special day for us. Thank you for making us feel so welcome, even as tourists. Glad you got the chance to partake in the American version of Gay Pride! I think it is beyond terrible that some people still stick with that negative attitude! Love is love, what else is there to say? 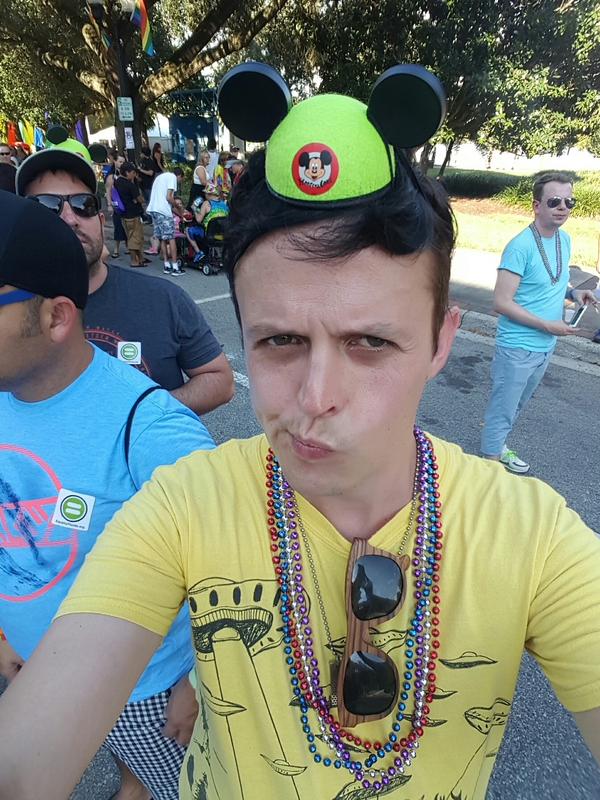 A lovely post from a gay British blogger about his experience at Orlando, Florida LGBTQ Pride. Sometimes it takes a fresh set of eyes and ears to truly capture an event like this. Read the post, you won’t be sorry! I’m also optimistic that bit by bit, the world will become accepting towards LGBTQ+ people, and we will no longer feel the need to hide!